In the years installing Linux has been seen as a difficult task, today almost everyone can use Linux and enjoy its advantages. 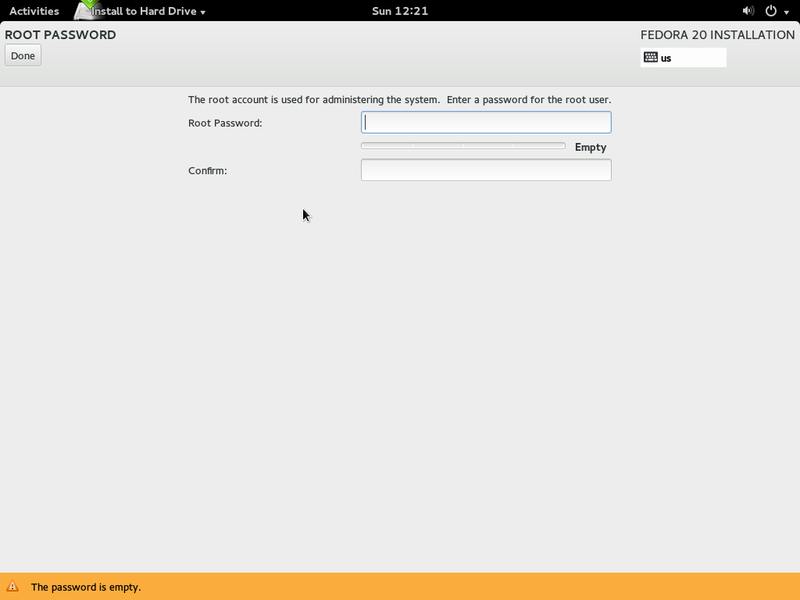 Fedora is a Linux OS which follows the FOSS philosophy, and one of the most popular Desktop distributions. In this post you’ll understand how to install it in a few simple steps. The first thing you have to do to proceed with the installation of Fedora 20 is boot it from a support (CD/DVD and USB Pendrives are today the best options), if you don’t know how to burn the image onto the support find a tutorial on the Internet or use this tutorial. Once you have your support, reboot your machine, select an option like “boot options” or “boot priority list” and select your support, in this way you should see this screen. Just select “Start Fedora Live” to get to the next point. 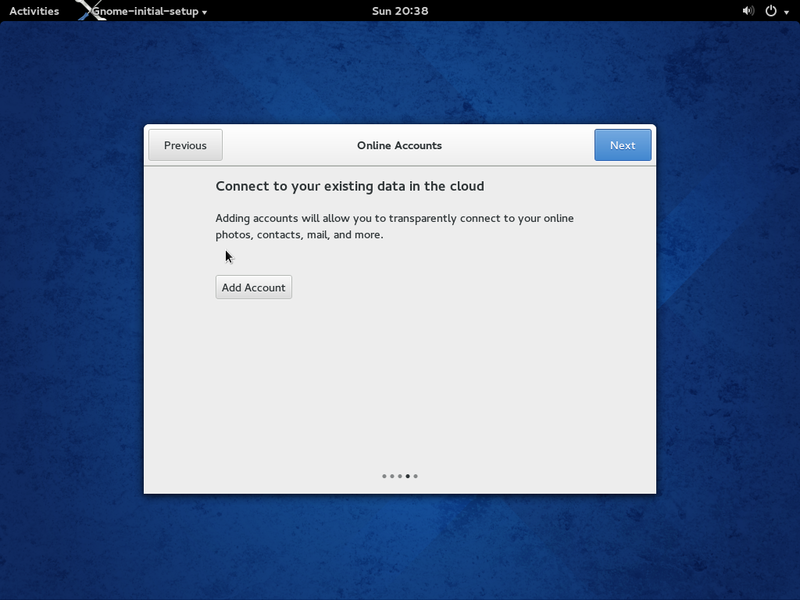 At this step you can choose to try Fedora or to start the installation process. You’re still loading everything from the support, so don’t disconnect it! If you decide to try it for a while (maybe to check everything is working fine) you can start the installation process through the Desktop Icon which will appear short after selecting “Try Fedora”. If you’re ready to go, just click “Install to Hard Drive” and head to the next step. By clicking install you’re now starting the installation process (Anaconda is the name of the program which makes everything so smooth). You still haven’t modified anything on your computer, so relax. In this step you’ll just select your language and your keyboard layout. From this point you can set everything needed to install Fedora 20 properly on your machine, and just as the program itself says “We wont’ touch your disks until you hit this button.”. So until you click “Begin Installation”, stay relaxed. We’ll examine each point of this hub in the next step. I won’t explain the “Keyboard” setting since you should have already set it in the 3rd step. In this screen you’ll set your time zone and your date and time. If you can, I suggest you to set the “Network Time” (you must have Internet connectivity), in this way you can obtain current date/time without touching anything and it will be kept automagically through time. This is the easiest case; just select “Click here to create them automatically” and then click “Done”. This outcome is the same as selecting “Automatically configure Fedora Installation…” in step 5.3. In this case you will have one or more OS installed, you can see them in the list. In my case I have “Fedora Linux 20 per x86_64” installed, you might have more. If you see “unknown” be careful, it might be Windows! If you want to delete an OS just click on it and click the minus (-) under the list. In this way you will delete partitions (and cause possible data loss) so be really careful, but no disk will be touched until you click “Begin Installation” in the hub. 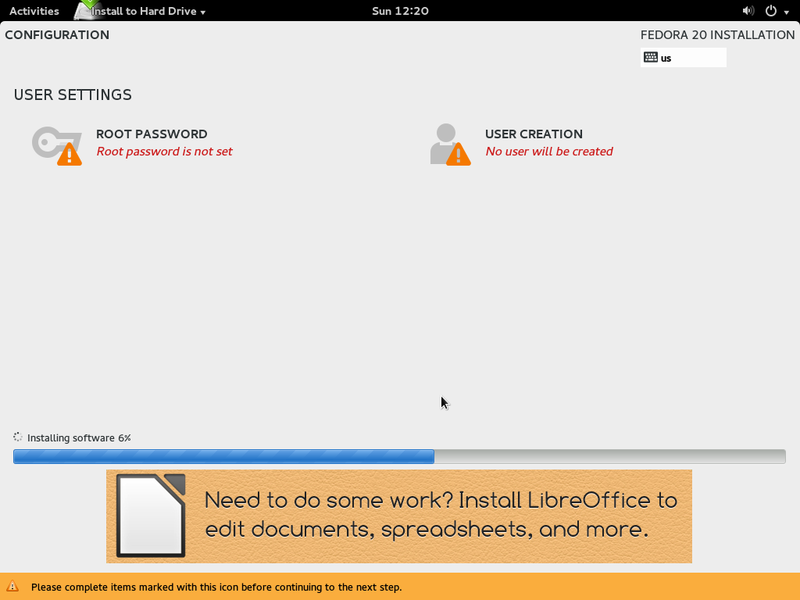 If you have a decent amount of space (>10 GB) you can install Fedora 20 next to other OS, just click “Click here to create them automatically” and everything will go smooth! Fedora 20 Ready to be installed! If everything went fine, you should be seeing a similar screen. Now you’re ready to go: touching “Begin installation” will start the installation process and will affect your devices chosen at step 5.3. Be careful! This is your last possibility to recognize mistakes, if you press this button you can lose entire hard disks depending on what you’ve done. Since this tutorial doesn’t cover partitioning I suggest you to ask an expert if everything is fine if you’re not sure about what you’re doing. In this step you just configure your user, if you want to be an administrator be sure to check “Make this user administrator” (in this way you can skip the following step). I also suggest you to use a password. Beware: if you use a weak password you’ll have to click “Done” twice. 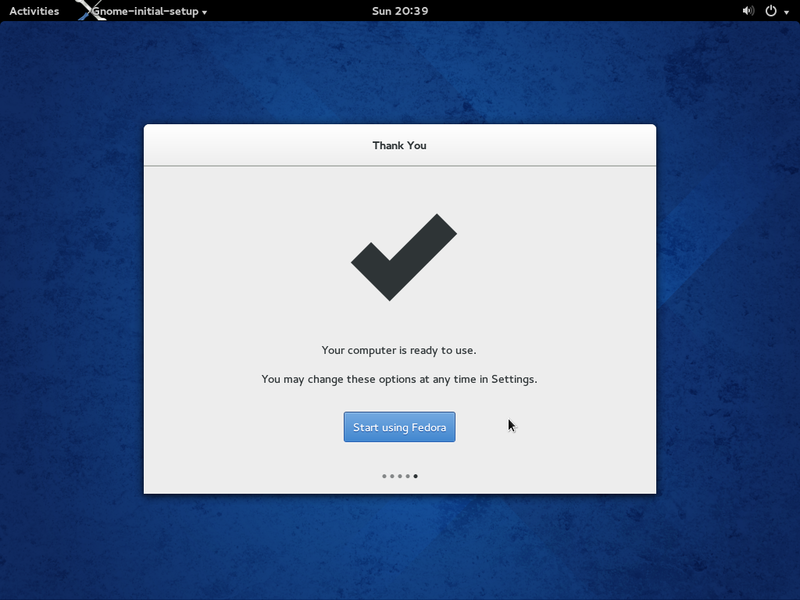 Congratulations, now Fedora 20 is installed on your machine, you can press “Quit”, wait for reboot and remove the installation support (IN THIS ORDER). The next few steps are first-boot welcoming settings to ease your experience. 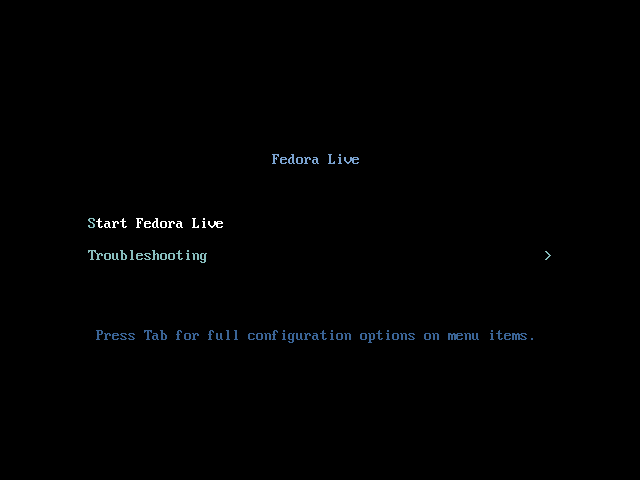 Now that Fedora 20 is installed you will see this screen for the first time you boot. It is a simple wizard to set few basic things. The first screen will ask you to choose system’s language. You already selected it during the installation but, if you want you can change it here. 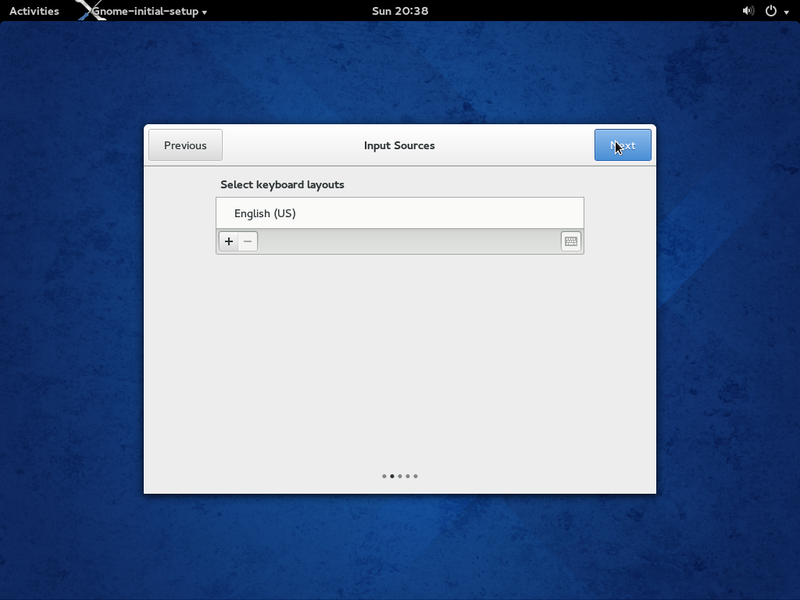 In this step you can set various Input Sources so that you can use multiple Keyboard Layouts. The first one is the one you specified during installation. 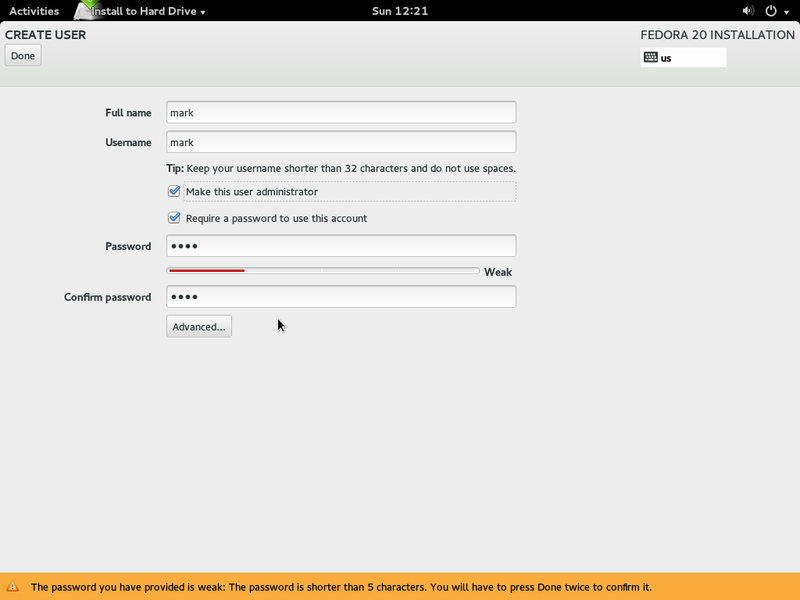 In this step you can take advantage of GNOME 3’s social features and add your Social Networks accounts to your system. But this is far from this post’s scope, so feel free to explore it alone, it might be a good surprise :). Done, this was the last step, now you can enjoy your new Fedora 20. Be sure to tune in next week for Fedora 21 release (9 Dec 2014)!